Appachey, one of the three boys featured in the documentary Rich Hill. Directed by Tracy Droz Tragos and Andrew Droz Palermo. Now playing. Rich Hill dunks us headfirst into the American lower-middle class, small town division: fly strips hanging in cheaply furnished bedrooms; a freight train passing through; pork tenderloin sandwiches at Suzie Q's drive-in; kids dejectedly filing into a high school; the dry husk of a mostly abandoned "downtown." Rich Hill, Missouri (pop. 1,396) is in the film territory of Paradise Lost, even though it's in another state — and we might as well add Mud, Gummo, and the documentary If You Build It to the movie cognate list. 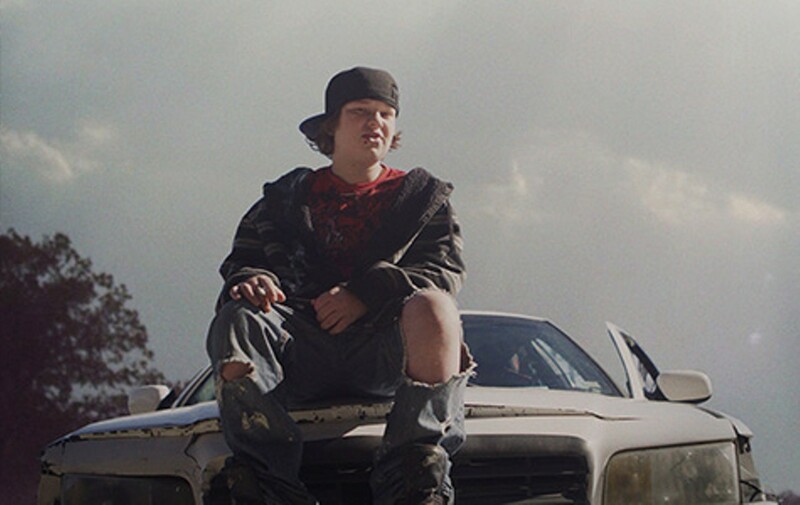 A spirit of neglect floats in the air that Rich Hill's subjects breathe. The doc's filmmakers, Tracy Droz Tragos and Andrew Droz Palermo, spend considerable time with three unrelated teenage boys from the wrong side of the tracks. The worst off is probably thirteen-year-old Appachey, a sullen, overweight skateboarder who nervously puffs cigarettes and communicates with a combination snarl-whimper when complaining about his life. Appachey is in trouble at school for assaulting a fellow student, but mostly keeps to himself. At home, from her bed, his defeated-looking mother recites a list of the ailments bothering her kids: ADHD, bipolar disorder — labels everyone knows. The house is a pigsty of dirty clothes and half-finished dinners. Later we learn that Appachey is being forced to repeat the sixth grade. The constants of his life are disturbingly familiar hallmarks of the underclass: fast-food meals, sugary drinks, low self-esteem, and nonstop TV and video games. We accompany Harley — a pierced fifteen-year-old with slicked-down black hair and a sly smirk — as he shops for knives at a local sporting goods store (he's too young to buy one; you have to be eighteen). Harley and eight other family members live at his grandmother's house because his mother is serving a prison sentence for attempted murder — as the film goes on Harley admits that he had been raped by his stepfather, and that his mother attacked the man in defense of her son. Even though Harley is taking meds and on probation at school over disputed "sick" absences, he has a humorous, engaging self-awareness. Compared to the other two boys, fourteen-year-old Andrew seems to enjoy some advantages. Slim, athletic, and good-looking, he lives with his parents and twin sister and tries to remain optimistic, even though the family has had to move numerous times. "We're not trash, we're good people," insists Andrew. But his dad Willie, a part-time handyman who performs a Hank Williams tribute act with a band, can't make enough to keep the family in one place. When the power company shuts off the gas, the family uses kitchen appliances to heat their bathwater. Andrew is very frank about his father's lack of success, but he projects hopefulness. The filmmakers provide no narration. It's up to us to watch and listen. The town's Fourth of July parade goes off without a hitch, as does a high school football game. There are very few editorializing montages, although in one memorable scene Harley's grandma is shrouded in cigarette smoke haze as she tells the bitter story about her imprisoned daughter being labeled a menace to society. Rich Hill won a prize at Sundance earlier this year for producer-director Tragos, a veteran maker of docs, and her cousin Palermo. Their approach to social problems is cool but sympathetic, with absolutely no tacked-on message of hope for distraction. Only the facts, served at room temperature, à la carte.